If you’ve ever stopped to look at the ingredients in your bottle of shampoo, you would likely find a list of 20-30 or more different compounds, most of which you cannot pronounce, and if you are like the average individual, you’d probably just say, “huh” and rub the nice bubbly lather all over your head anyway. But what if you stopped to dissect every ingredient instead? You’re probably waiting for me to now start expounding on every ingredient contained in a bottle of popular shampoo, but sorry, I’m not going to do that this time. Number one, I don’t have the hours and hours it would take to do that, as there’s WAY more ingredients in shampoo than in that toxic chapstick which took me a couple of hours to dissect. Number two, trust me when I say that shampoo contains a number of toxic ingredients: endocrine disruptors, carcinogens, and just plain junk. If you wish, you are more than welcome to look them all up individually! In my search for a less toxic shampoo alternative, I’ve run across a lot of different options: some products, such as Carina Organics, are among the very few commercially prepared products that don’t include “just a few” questionable ingredients; baking soda and vinegar rinses; and of course, the “no-poo” option. And then there are DIY shampoos like the one that I will include here. I found this shampoo to be very nourishing to my hair. While it seemed a little heavier on my hair than other options (I have very fine hair), it also was great for helping to tame my crazy, frizzy curls and straightened it for me without having to use an iron! 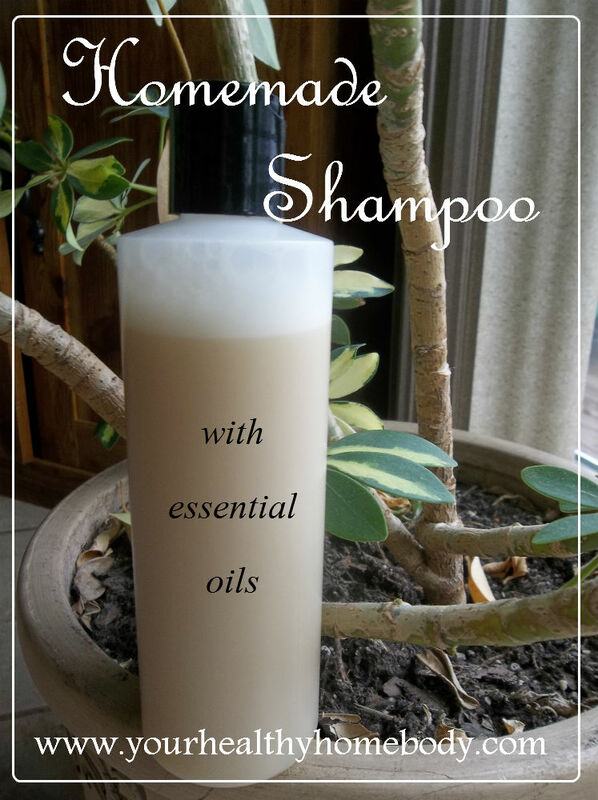 So, for all of you who just can’t go shampoo-less yet, here’s a nice non-toxic alternative to commercial shampoo! Thanks to Shalom Mama for the original recipe. Mix all of the ingredients in a bottle (I used an 8oz sized bottle), and shake to combine. Easy peasy! Gotta love squeaky clean hair! What oils would you recommend for dry, coarse hair? Does the coconut milk stay well outside or do we need to refrigerate this shampoo? How long will this last? And i have very oily hair.. what can i change to not make my hair oily after shampooing? Yes, you can keep this shampoo outside of the refrigerator. I have used it for about a month or so. For my hair, which is very fine, I prefer to use shampoos and conditioners by Carina Organics (there is a link to their website on my “Healthy Home” page). If you find that this shampoo is too heavy or oily for your hair, you could try their products. Also, some have found good success with oily hair by using apple cider vinegar as a rinse.